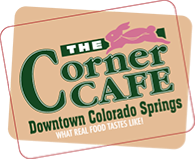 The Corner Cafe is a gourmet breakfast and lunch restaurant right across from the courthouse in downtown Colorado Springs. All of the food is made the old fashioned way with an emphasis on quality, freshness, and service. Everything is made fresh to order, the burgers are made by hand, not by a machine. The chicken breast is fresh, not frozen. The fries are cooked in 100% pure, cholesterol-free rice oil. Our pork green chile is to die for and our pies were voted the Best in The Springs by The Gazette. Come by and give us a try.